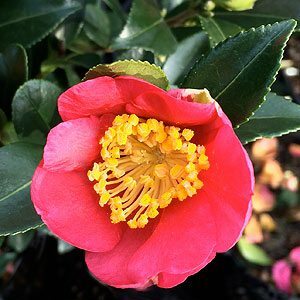 One of the best red flowering Camellias is Camellia ‘Yuletide’. The combination of the deep green glossy foliage and red flowers with yellow stamens makes this a very attractive feature plant even for a small garden or courtyard. The flowers are singles at around 8 cm across, and appear in profusion from autumn to winter.. In the northern hemisphere it will flower just before Christmas, in the southern hemisphere it flowers in autumn to winter. It makes a great feature plant and is also suited to using as hedge. Growth rate is regarded as slow, however with good soil and appropriate fertiliser it should grow well. Having a naturally upright habit Camellia ‘Yuletide’ works well as a low to medium screening plant. Also suited for use as an espalier if trained from an early stage. Once established this is a virtually no maintenance plant. Occasional pruning to maintain the desired shape and height, along with yearly applications of fertiliser and mulch will be all that is required. This is a camellia that is suited to growing in containers. Use a good quality potting mix and apply a specialist camellia fertiliser each year. Although slow growing, it also makes an attractive hedging plant. Try spacing at around 1m apart for a dense hedge over time. If you miss a year with fertiliser or mulch, this tough plant will survive with ease. Height – Over time you can expect Camellia ‘Yuletide’ to reach around 2 metres in height. Spread – To around 1.5 to 2 metres depending on pruning regime. Position -Best is full sun to a little afternoon shade in warmer climates.